From a distance, Jay Howell had a surprisingly successful career. He played for 14 plus seasons in the majors, was part of a World Series champion and was named to 3 All Star Games. He also was featured in two of the biggest trades of the 1980s. But man he had a strange career, one where bad things kept popping up in glorious moments and his injury led directly to another player becoming a Hall of Famer. Howell was born in Miami but went to high school in Colorado, foreshadowing the expansion of 1993. The Reds picked him out of high school in the 12th round, but he didn’t sign. Howell went to college at University of Colorado and was drafted again by the Reds, this time in the 31st round. Most 31st rounders do not become 3 time All Stars, so the scout who signed him deserved a bonus. In 1976, his pro career began in Eugene. After stops in Tampa, Nashville and Indianapolis, he made his big league debut with the Reds in 1980. He hit the first batter he faced, Steve Garvey. He would then retire Ron Cey, Pedro Guerrero and Rudy Law. It would not be the last time he was associated with the Dodgers. A week later, he allowed 4 runs while retiring none of the 6 batters he faced, ruining his ERA for his short stint with the Reds. In 1981, he had another unimpressive big league cameo, this time with the Cubs. By 1982, he found himself on the Yankees, again struggling at age 26. He had a bad season in 1983 as well, posting a 5.38 ERA. If anyone had told you then that he would make 3 All Star games, they would have been committed. In 1984, Yankee manager Yogi Berra used Howell as a set up man for Dave Righetti and he was effective. Whenever a relatively young player was effective under George Steinbrenner in the 1980’s, there was only one fate for them: They would be packaged in a deal. Howell was sent packing to Oakland with Jose Rijo, Eric Plunk and Stan Javier for Rickey Henderson. The Yankees got a Hall of Famer and the A’s got some depth. In his first year with the A’s, Howell saved 29 games, won 9 and posted a 2.85 ERA over 98 innings of relief. He made the All Star Game and gave the A’s a little bit of hope for the future. In 1986, he saved 16 games and played for new manager Tony LaRussa. In 1987, Howell got off to a poor start, allowing 10 runs in his first 13 1/3 innings. His May wasn’t much better, posting a 5.14 ERA. In June, however, he struck out 13 batters and did not let up a run for the entire month. That lowered his ERA to 4.20, but still it was too high for a closer. So naturally he was named to the All Star Game. In front of his hometown fans in Oakland, Howell let up 2 runs in the 13th to take the loss. His July was pretty grotesque along with the national spotlight on his loss. Including the All Star Game, he lost or blew a save in 6 of his first 7 appearances in July and his first game in August. He pitched to a horrific 12.96 ERA for the month and by mid August, was shut down for injuries. Needing a closer for the team’s slim playoff hopes, Tony LaRussa turned to washed up starter Dennis Eckersley. If Howell was effective in July and not hurt in August, Eckersley might not have received the chance to revive his career and put himself on the path to Cooperstown. With Howell no longer needed, he was shipped off again in a 3 team super complicated deal that sent Bob Welch and Matt Young to the A’s, Howell, Alfredo Griffin and Jesse Orosco to the Dodgers and several young pitchers to the Mets. Expectations for the 1988 Dodgers were not exactly sky high. The Giants and the Reds were consensus picks for the Division. But they jumped out to a 13-7 start and never posted a losing record for the season. On May 26th, the Dodgers won and Howell got the decision over Philadelphia. They went into first place themselves and never fell back to second for the rest of the year. Although Orosco began the season compiling saves, Howell would wind up leading the team with 21. Tommy Lasorda spread the wealth around in terms of saves as Orosco notched 9 and Alejandro Pena picked up 12. Even Tim Belcher, Fernando Valenzuela and Orel Hershiser picked up saves along the way. When the NLCS began, the Mets were heavy favorites over L.A. In Game 1, with Hershiser pitching and his scoreless inning streak pouring over to the post season, the Mets rallied in the 9th. Howell blew the save and the Dodgers took the loss. Rain postponed Game 3 and gave Lasorda a chance to start Hershiser again. Howell came in relief and again was ineffective. This time, the umpires found pinetar in his glove. He was suspended for the rest of the series and the Dodgers lost. LA lost both Hershiser starts and no longer had their closer. The Mets winning the pennant was a foregone conclusion. Instead LA rallied and got saves from Alejandro Pena, Brian Holton and even Orel Herhiser before seeing Hershiser throw a complete game shutout for Game 7. With Howell back on the roster, he did not help his cause when he let up a walk off homer to Mark McGwire to end Game 3 of the World Series. In Game 4, the Dodgers trying to curb the A’s momentum, LA sent Tim Belcher out to face A’s Ace Dave Stewart. Sloppy Oakland defense gave LA an unlikely 4-2 lead in the 7th. The A’s rallied in the 7th and Dave Henderson doubled home Walt Weiss to make it a 4-3 game. With 2 outs and the tying run on second, Lasorda decided to go to his closer early. Howell did not inspire confidence when he walked Canseco. Then an error put Parker on and the bases were loaded. Mark McGwire, whose homer sunk Howell the night before, was at the plate. Howell got McGwire to pop up on the first pitch. The Dodgers went to the 8th, up 4-3. In the 8th, he worked around a single to keep the lead. With Pena and Orosco warming in the pen, Lasorda stuck with his embattled closer. With one on and one out in the bottom of the 9th, Howell faced Canseco, knowing that a homer would win the game and tie the series. He got Canseco swinging on a full count. Then Howell got Dave Parker to pop up to third base to end the game. Howell earned every bit of his 7 out save. After the game, Lasorda gleefully admonished the writers who trashed Howell in their columns the day before. 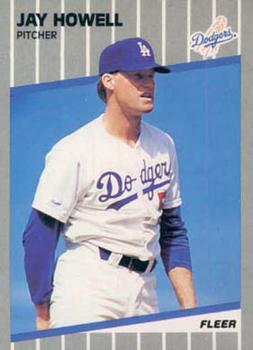 Howell was not needed in Game 5 as Hershiser went the distance with another clinching shutout. 1988 was a strange season for Howell where he became obsolete from his previous employer and a disgraced cheat and a walk off loser in the playoffs… and yet ended the season with a high wire act save and a World Championship. He would make the 1989 All Star team and play until the 1994 strike. A strange career and yet one with lots of memorable moments, good and bad, and worth honoring.